The Rebel Sweetheart. 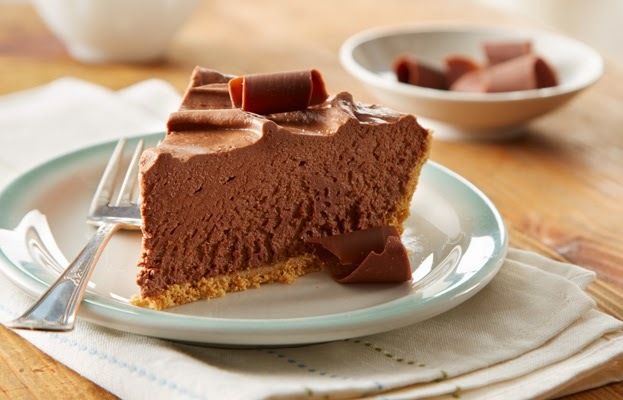 : Foodie Goodie | No-Bake Chocolate Cheesecake. So you want to make your Mom a cake for Mother's Day. But you don't know how to bake. You don't even know how to turn the oven on. And you can't ask Mom for help because it's supposed to be a surprise. 1. Place chocolate chips in small microwave-safe bowl. 2. Microwave at medium for 1 minute, then stir. If necessary, microwave at medium an additional 15 seconds at a time, stirring after each heating, just until chips are melted when stirred. Set aside to cool. 3. Beat cream cheese, sugar and butter in large bowl on medium speed of mixer until creamy. 4. Gradually add melted chips, beating on low speed until blended. 5. Fold in whipped topping until blended; spoon into crust. 7. Garnish as desired before serving. As seen on Hershey's Kitchens. Shared with Food Friday and Food Trip Friday. No bake sounds good to me, akala ko chocolate talaga cheesecake pala! Was trying to imagine paano ang no bake chocolate cake lol. That looks delicious. I love chocolate cheesecake. No bake and chocolate. 2 of my favorite words. Will try this! Thanks for sharing! OheMGeee! No bake choolate cake wanna try it! I wanna try this one! I have to try this! Thank you for sharing this! I have to make a dessert for Wednesday. This looks delicious and easy. Double win. Thanks! Yum! That sounds so yummy. I am craving chocolate something fierce right now. I should try this at home - maybe next weekend. I have bookmarked! This is a no bake and that is great because that means I can make one for us and I will let you know by tagging you either on Twitter or Fb. The picture itself looks good already!! :) Yum! I'm sure your kid loves you even more! Will definitely give this a try! I'm always looking out for no bake recipes. Thanks for sharing this! yummm! i haven't tried adding melted chocolate to my no-bake cheesecakes, yet...definitely a must-try! thanks so much for sharing over at Food Friday, sis!